One of Páll Guðmundsson’s sculptures outside his studio in Húsafell. It wasn’t obvious at first. The snap of the wind off the Atlantic, and the sheer scale of the mountains plunging into the sea all around us, didn’t initially suggest that Iceland’s landscape was one that invited people in very much. Our first glimpse of a highway outside of Reykjavik was covered in slush half the way, and it was hard to look out the car window, because the snow in the fields was so bright. My partner Finn and I were in Iceland last month trekking around snowy peninsulas, saga museums, and glacial creeks. I caught the bug so many of us have, listening to Björk’s music in high school, and then urgently needed to see the land of eruptions and emotional landscapes she sings about. Maybe the first hint of the vision was how reverently our guide that day talked about the creek we were about to swim in. Called Silfra, it is a small watery crack in an expanding continental fissure between two tectonic plates, and that 4-kilometre long plain grows as fast as your fingernail. Over the centuries, the drift opened up this channel wide enough for groups like us to snorkel in. Before we slapped our snorkels and drysuits on, our guide cautioned us to let the current from the glacial melt push us along, and take time to meditate as we peered down to boulders many metres down through the ghostly blue-green light of what he called “the cathedral”. Finn in front of the inimitable Hallgrímskirkja church in Reykjavik. 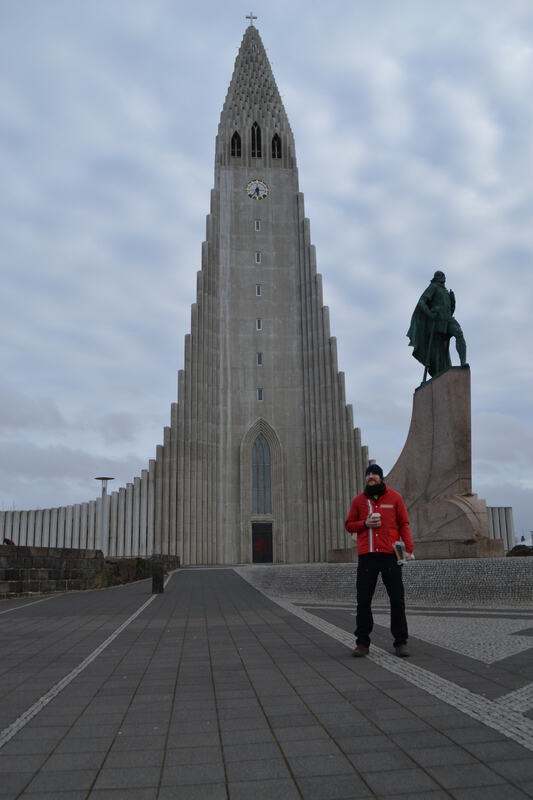 Or maybe the first hint was seeing Hallgrímskirkja, the towering Lutheran church that overlooks most of Reykjavik, with its narrow pillars sweeping up to its belfry. The architect, Guðjón Samúelsson, is said to have been inspired by the shape of the basalt columns left by volcanic eruptions around the island. It certainly became more clear when we swished our fingers around in a hot spring pool that had been built about eight centuries ago. It was hard to deny when we visited a geothermal plant helping deliver Reykjavik’s supply of electricity and steam heat — almost entirely collected from boreholes deep beneath the earth channeling superheated water to the surface. But it was impossible to ignore when we met an artist named Páll Guðmundsson. 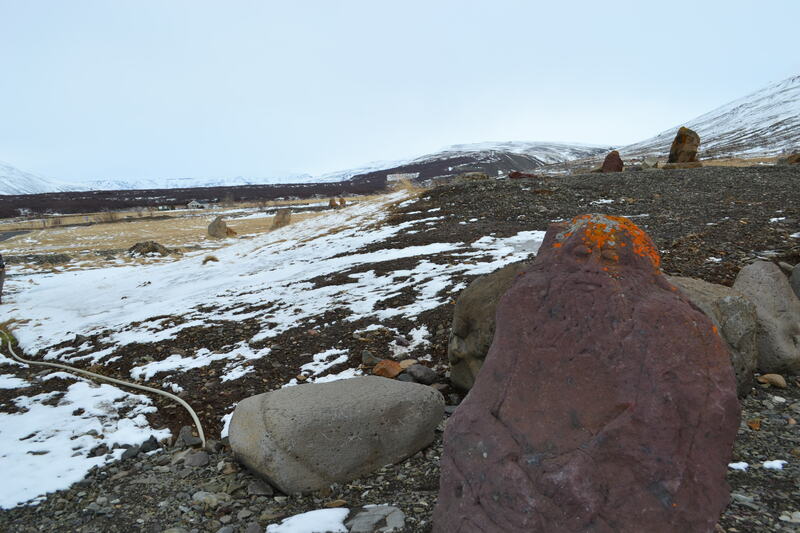 Páll was initially described to us as a pretty interesting sculptor who made faces out of rocks. When we drove into his village of Húsafell though, and saw stone cairns in circles along the road leading up to a workshop nestled beneath a grassy hill, we knew it was something more. A friend of his from a nearby museum called ahead for us and asked Páll if he could show us some of his art. There, in the shadow of icy slopes overlooking farms and broken lava fields, this gentle man in a knit toque opened the doors of his workshop for us, and walked us past his sculptures to a musical instrument I didn’t recognize – because he had built it. On long tables against the walls, he’d laid out rows of narrow stones, some with lichens or charcoal faces. He called it a steinharp (or stone harp), and he told us he found the rocks himself in the mountains and canyons nearby. Then he pulled out two handfuls of mallets and played us Bach, and a composition he wrote himself. Through the clear, hollow notes of the steinharp and the rocky faces he showed us in the fields outside, I realized I was literally seeing people in a landscape, and seeing their image built out of the land itself. I couldn’t stop saying “Wow,” over and over. What Páll showed me, and what I saw in that power plant, and in the church columns, was a model of how to imagine a world with space for humans. Many of us live in spaces that say nothing about the land we live on, or its history. If you drive to the outskirts of any urban centre in North America, you’ll see roughly the same drab squares of home improvement and furniture stores. Our finest buildings could be plopped down anywhere (and in Edmonton, they’re often designed for a Californian climate). Maybe that’s why it’s so hard to imagine living like we’re part of the land. There is a space for us everywhere we are, though. Our homes don’t necessarily have to be made out of handfuls of rocks and lichens from the creek down the street. But we can find ways to carefully observe what’s around us, what we can add to the land to make it better, and how we can reflect our histories in ways that respect the place they play out on. There are stories to be told about the land here in Alberta. We can live like we’re here for good.